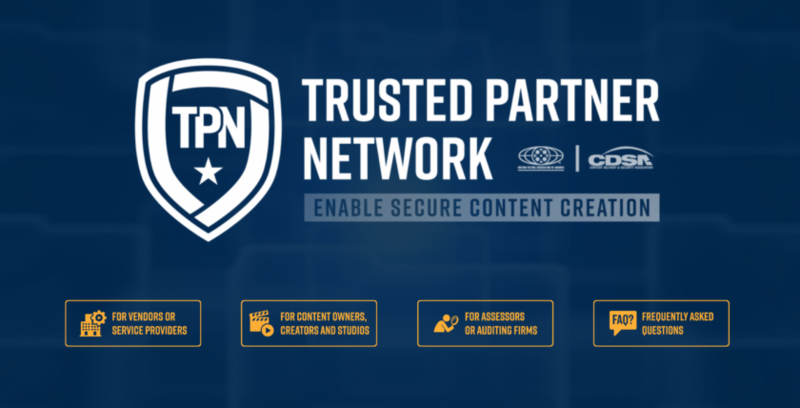 The Trusted Partner Network (TPN) — an industry security initiative supported by 28 media and entertainment companies, created by the Motion Picture Association of America (MPAA) and the Content Delivery & Security Association (CDSA) — will see its top executives offer a program update on Dec. 5 at CDSA’s annual Content Protection Summit (CPS) in Marina del Rey, Calif.
• “TPN 101” will see Guy Finley, TPN CEO, Kurt Fischer, MPAA’s director of content security and TPN COO, and Ben Stanbury, CDSA chairman and TPN CTO, share the latest with the program, including an update on the nearly 500 entertainment services companies currently in the TPN assessment process. • “TPN App & Cloud Initiative” has Keith Ritlop, chair of the TPN App & Cloud Subcommittee, and TPN Technology & Development Advisory Committee, sharing how next year will see a new phase of TPN, with the organization working with technology vendors and their customers to identify and prevent application, device, storage and workflow vulnerabilities. The work looks to the future of security and protection in content creation and information management through the centralized TPN Platform. • “The State of Vendor Security” will features a panel of TPN vendors, who are set to share their experiences of having gone through an assessment, and the impact it’s had on the security of their physical locations, employees and customers’ content. The TPN Workshop sessions offer attendees the opportunity to engage with other members of the TPN Guardians and community. All are invited to MESA’s Holiday Party and CPS Networking Reception which immediately follows. The 2018 CDSA Content Protection Summit is presented by SafeStream, and sponsored by EdgeScan, Microsoft Azure, LiveTiles, Aspera, Amazon Web Services, Convergent Risks, Dolby, NAGRA, EIDR, the Trusted Partner Network (TPN), Videocites, Human-i-t, Telesoft and Bob Gold and Associates and is produced by the Media & Entertainment Services Alliance (MESA) in association with CDSA, the Hollywood IT Society (HITS), Smart Content Council and Women in Technology Hollywood (WiTH).